The Congressional Research Service is an indispensible tool for analysts of global politics. This report upon the current situation in Yemen deserves a much wider audience than it probably will get. Our understanding of the Middle East is often an understanding of its central countries- the oil rich Arab states, Iran, Turkey, Syria and Palestine. Yemen though is and has been throughout history a vital area both in terms of its geopolitical position, at the edge of the Red Sea and the Indian Ocean and in terms of its influence both on developments in Africa and in the Middle East. To take an example many analysts worry that Yemen may become a base for the Somali Islamic Courts movement- both to acquire arms and to flee should they need a retreat. Saudi officials assert that Yemeni weaponry has been found in raids on Islamic militants in Saudi Arabia- a cause for some concern to both the Saudi authorities and to their Western Allies. Part of the reason for these concerns lie not so much in the fact that the Yemeni government, led by the veteran Ali Abdullah Salih, tolerates terrorism though it does protect at least one prominent Al Quaeda sympathiser but in questions about its ability to govern. Yemen is a Republic, Salih has been involved as a leader in Yemeni politics since the 1970s but won an election last year. The European Union election monitors concluded that the election represented 'a milestone in the democratic development of Yemen... for the first time in both Yemen and the region an incumbent faced a proper challenge at the polls' and yet they described various very real flaws in the electoral process. Yemen is one of the poorest countries on earth- according to the CIA World Fact Book over 40% of the population lived below the poverty line in 2003. Its also one of the youngest countries on earth- the median age being 16. The issues that that creates are obvious- firstly there is an abundance of weaponry within Yemen- the Congressional report estimates that in a nation with 20 million people there are 60 million guns- when you realise that fifty percent of the population are under 16 that statistic gets even more frightening. Furthermore, the country's government is prone to corruption: over 2.5 billion Rial were recently lost from the Treasury. Yemen's problems are ones of governance- and ones that may well be soluble. The issue in many ways is that Yemen's government needs to control its own operations better and diminish corruption and also needs to control the arming of its population. In many ways Yemen provides us with a test case for Neo Conservative rhetoric in that this is just the kind of society that looks as if it could change, as if its rulers are open to reform, and which if reformed would be less responsive to global terrorism. Yemen ought therefore to be as central in our minds when we analyse foreign policy in the Middle East, as it is peripheral at the moment. You did good. 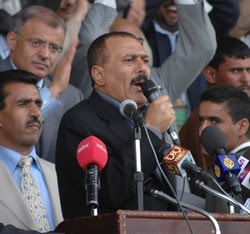 The factors that enable Saleh to remain in power (nepotism, corruption, politicization of the judiciary and military) are the same ones that need to reformed in order to save the state from failure. However, I agree with you that Yemen, maybe more than most states in the region, has the potiential to achieve popular empowerment, and that democracy in general is broadly legitimized and desired by the population. Thanks Jane I agree there are problems still. Jeremy wasn't Palestine a British mandate in the 1920s so it was at that point a potential country, I don't want to get into a terminological dispute here- there is a political issue and the Yemenis take one side of it adn that's all for this post I'm interested in.